“Submitting my music to Pioneer Records is one of the best decisions I have ever made. I feel absolutely honored and blessed to be given this opportunity. I want people from every walk of life to be able to connect to my music in some way." 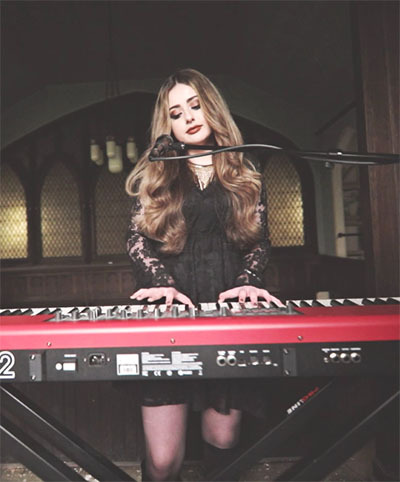 Pop/rock singer, songwriter and pianist Allissa Logsdon, in collaboration with Pittsburgh rap and R&B artist Victor Gariseb, was selected by Pioneer Records as its latest artist to join the student-run record label. Logsdon is a senior sports, arts and entertainment management major and native of Pittsburgh's Munhall Borough. Gariseb is a freshman acting major from the town of Swakopmund in Namibia, Africa. The two artists were chosen among 23 artists and bands who submitted their music. “Winning the Pioneer Star contest comes with so many opportunities that I would not be able to find or afford on my own. It is such a wonderful way to kickstart your music career and set you up for success,” Logsdon explained. Gariseb, who is most inspired by local musicians and his brother, added: "I just want to learn how to build a stable platform for myself." As a new Pioneer Records artist, Logsdon will receive 300 copies of an extended play (EP) record produced by Jesse Naus at Red Caiman Studios. Additionally, Logsdon and Gariseb will collaborate on a music video produced by Point Park’s cinema production and SAEM students, and will be featured at a CD and video release party at Stage AE hosted by Pioneer Records in the spring. “I am excited about literally everything. I can’t wait to record my new songs and hear them come to life. I am also really looking forward to collaborating with Victor on one of my original songs. He is so talented, and I think we will create something really special together,” Logsdon said. Pioneer Records will book and manage Logsdon’s shows throughout the year, including an upcoming evening performance with Gariseb Oct. 27 in the University’s Academic Village Park for Pittsburgh’s Fright Up Night. Last spring, Logsdon won the Women Who Rock Contest at iHeartMedia Studio, landing her a performance at the Hard Rock Café in Pittsburgh. “Between her voice and personality, Allissa truly is the complete package. 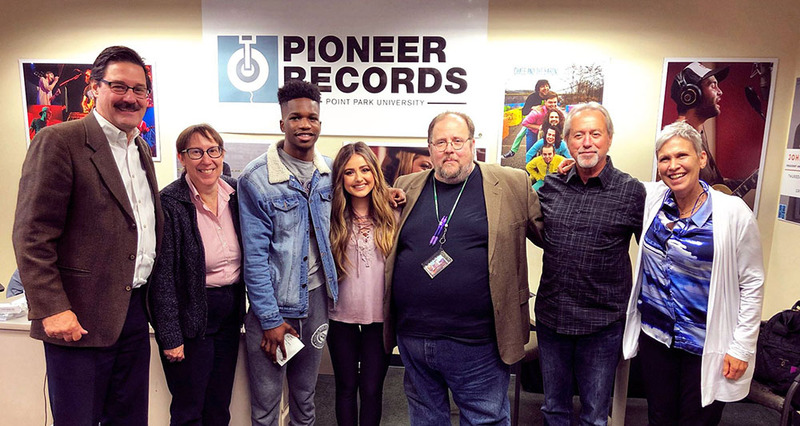 Having her partner with Victor also brings out our vision on what we would like the future of Pioneer Records to look like, bringing music from different backgrounds together to create art we love,” said Molly Knepper, a senior SAEM major and director of operations for Pioneer Records. In addition to Knepper, current Pioneer Records apprentices and interns include Megan Clista, Mariah Gigler, Grace Issac, Alyssa King, Gabby Kramer, Derek Makin, Amber Montz, Tyler Richey and Hannah Uziel. Logsdon added: “Submitting my music to Pioneer Records is one of the best decisions I have ever made. I feel absolutely honored and blessed to be given this opportunity. I want people from every walk of life to be able to connect to my music in some way." Previous Pioneer Records artists include Hannah Jenkins, John Kono Rushlander, Chase and the Barons and Gabe Reed.